(Source: GeneralFanager.com) – Offer Sheets are contracts that can be offered to a Restricted Free Agent (RFA) by a team that does not own his rights. The team owning the player’s rights will have 7 days to exercise a Right of First Refusal. 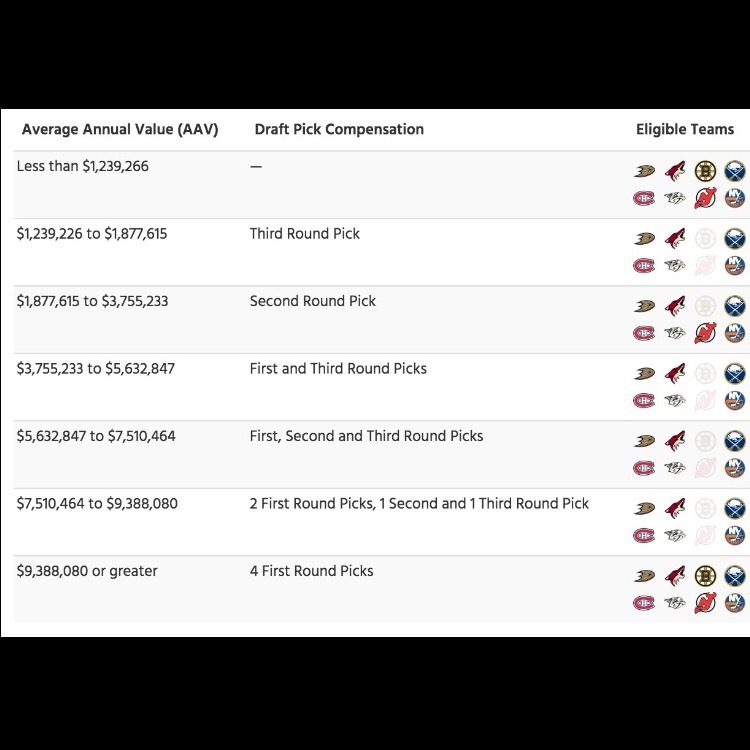 If the team does not exercise their Right of First Refusal, they will receive draft pick compensation according to the below table, based on the Annual Average Value (AAV) of the contract. To be eligible to submit an offer sheet, a team must have the required compensation picks available and all compensation draft picks must be the team’s original draft picks (no substitutions with picks acquired from other teams). A team can reacquire their own draft picks in order to become eligible for RFA offer sheets. Every draft selection required for compensation must be from the next draft, except where more than one draft pick from the same round is required forcompensation. Breakdown of the lack of picks the Bruins have to tender offers on RFA defensemen. I’m not going to beat this thing to death because talking contracts, draft picks, and compensation can sometimes tie a brain in knots. But the chart above sums up what’s gone down in Boston and makes it very simple to digest. Simply put, if another team has a legit defenseman (say, a Seth Jones in Columbus) who is a restricted free agent and the Bruins would like to offer him a contract, they can’t. They don’t have the draft picks in the bank to give as compensation to the other team should the players rights holding team not match the Bruins offer. Historically offer sheets to RFA’s have not been the most common way of acquiring players in the NHL, but in the cap era and lack of a rapidly increasing salary cap we should begin to see more teams making offers on restricted players. The chart above shows the Bruins can only go after an RFA that’d command $9.338M per season or more, and it’d cost Boston FOUR 1st round picks. That’s not going to happen. As for all the other less expensive worthwhile targets? The picks needed to be in play for those players have been burned by Don Sweeney on Zac Rinaldo, Lee Stempniak, and John-Michael Liles.